As I wait for a part I need to finish my extra mod for the BNR34 diffuser to arrive (so I can do my true last post on the diffuser install), let me also showcase something ELSE I had done at BeAmbitious, and the real reason it took over a week to get the car back to me. So during my research into the mechanical differences between the R33 and R34 GT-Rs, other than aerodynamics, the other area where the R34 improved upon the R33 was in body rigidity. This makes sense, I believe my car is a much better handling car since the addition of various NISMO underbody brace bars, and especially the Nagisa Auto fender brace. Now the Series 3 has additional bracing in the trunk, but that is in the front of the trunk area - between the struts towers and the rear wall framing where the battery is located. And this is a result most likely because the BNR34 was being developed during the run of the R33 and in fact the BNR34 test beds were modified R33s. So likely, these braces were an improvement that was discovered during the BNR34 development, and incorporated into the later R33s. 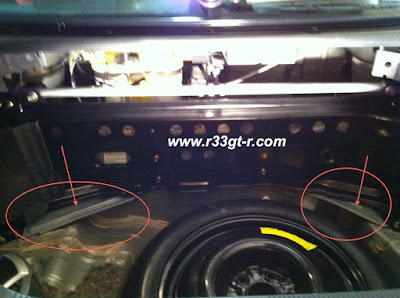 There was one improvement that isn't that well advertised or known, and that is the brace bar in the trunk of the R34. 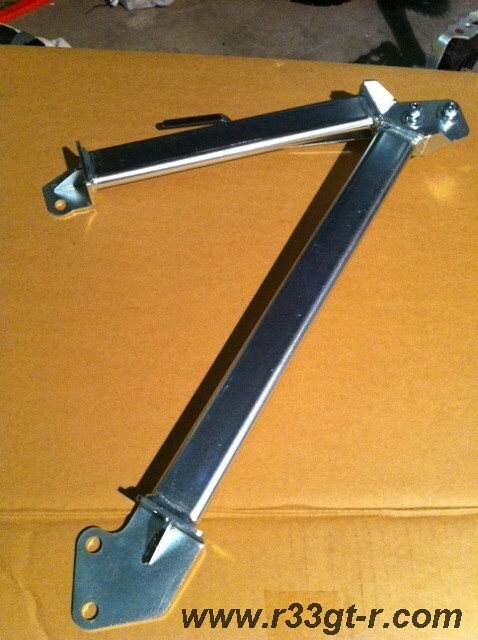 Not sure why this didn't make it into later R33s, as it is an easy piece to add, however this brace bar concept DID make it into certain models of the S15 Silvia. So when I began my search for a used piece, I was able to find one in decent shape off of an S15. 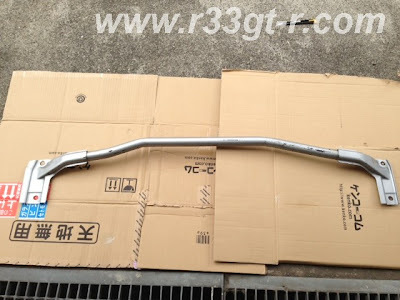 I had also read on Minkara of another R33 GT-R owner (and also a few ECR33 and even ER34 owners) who had installed an S15 trunk brace bar without issue, so rather than searching for a BNR34 one, I picked up one of the more easily available S15 ones. 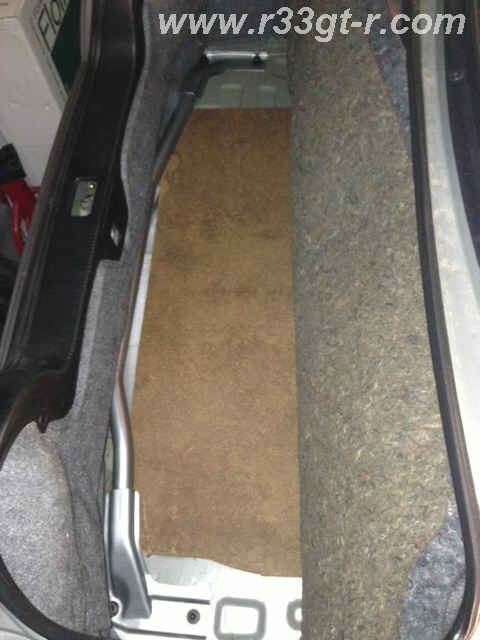 When it arrived, it was in good shape, with some scratches, presumably caused by items in the trunk! 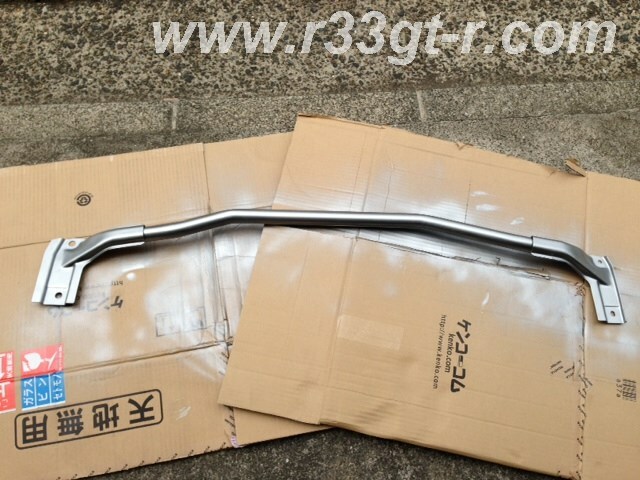 I let Ninomiya-san of Be Ambitious take care of the install while I left the car with him in order to install the R34 V-spec rear diffuser. 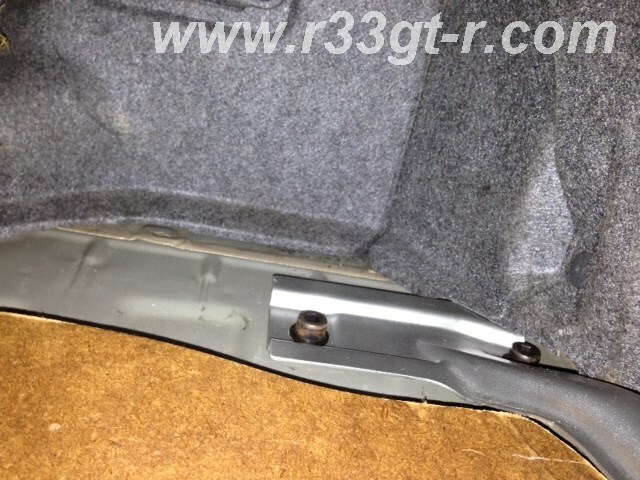 It turns out that there are already holes pre-drilled in the trunk in the right place (under some rubber caps), however what needs to be taken care of is to have something fill the gap between the floor and the bumper reinforcement, which also has holes pre-drilled. (Apologies but since I did not do the install I don't know what size bolts...). For my car, Ninomiya-san had some billet anodized aluminum spacers custom made (not cheap), but it is obviously more solid than what people usually do, which is to stack washers one on top of each other to fill the gap. And getting these spacers made took over a week and hence the delay in getting my car back to me (I thought the diffuser and trunk bar install would take a day or two, but it ended up taking a week). EDIT - Mook on the UK GTROC forum did this mod - here is a link to some GOOD installation photos and information on the bolt and spacer sizes. Thanks to both Mook for the photos and K66 Sky for the information. Anyway here is how it looks now, installed. Now what about the result? Did it change the car? In a word, "yes!" Definitely! On my way home after picking up the car, it's only a few kilometers, but immediately the car felt "shorter" - I know that sounds odd but that is the best way to describe it. Later, I took a 2 hour drive into Tokyo, and discovered that, in addition to the car feeling shorter, the suspension seems much stiffer now. What was before a firm but pleasant ride is now on the verge of being a bit too harsh! So unless this is a placebo effect, I guess my senses are telling me that, before the trunk flexed and allowed the dampers to feel softer - now as the trunk area is more solid, the dampers don't have as much "give"... at least that's my theory. Any thoughts, my friends? Am I imagining things? I think I am going to continue making the body as rigid as possible without the use of a roll cage, until the car feels like it's carved out of one solid block of steel. I will look into spot welding, but have heard that rusting can be an issue, so I may just have to see what else is out there that is bolt-on. You're not imagining things, Aki. A trunk bar really can change how the car handles. 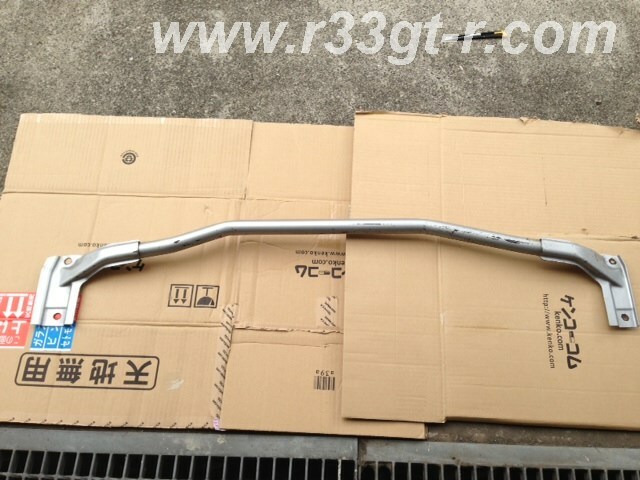 I got the Nismo trunk bar for my BNR32 and it totally changed the way it performed. Previously, when the soft and flexible chassis of the BNR32 went over bumps, the back end flexed and bent and wobbled so much the trunk lid rattled like a rattle snake. It was rather scary, as it would unsettle the car. With the bar installed, structural rigidity improved vastly. No more rattles and flexing, the suspension could dampen the bumps, and the car felt more planted. Many thanks for your kind comments! So you seam welded only the boot floor - is this along the sides on the sides of the wheel well? Very interesting. I guess in comparison, the R34 had more welding on the C-pillars,thus suggesting the next step I was thinking about... good to know a proper shop should be able to do the weld work!